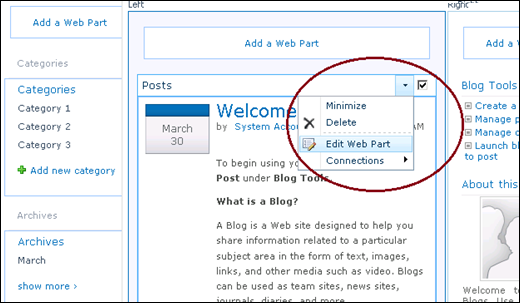 If you are using the out of the box SharePoint blog site and you want to customize the layout of the blog posts, this is how you do it. This requires you to create a new XSL template file and then connect that file to the blog post. 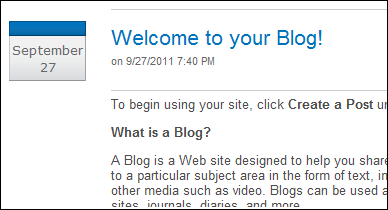 This example shows how we remove “By” section of the blog post shown in the figure below. 2. Get a copy of it and rename the copy. (Ex: CustomBlog.xsl). Make sure CustomBlog.xsl is saved in the same directory as blog.xsl. 4. Go to the Blog home page (http://<blog>/default.aspx), then Site Actions –> Edit Page. Select Edit Web Part option of the Posts Web Part. 5. Expand “Miscellaneous” section of the edit web part properties window. Specify “/_layouts/xsl/CustomBlog.xsl” as the XSL Link. Save properties. 6. Save changes and refresh the page. 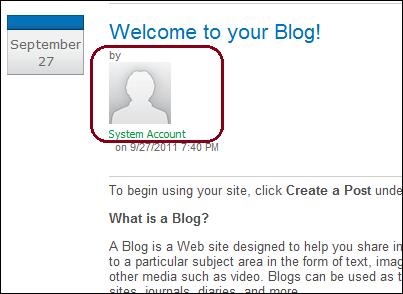 You will find “by” section is removed from the blog post as shown in the below figure. Thanks, how do you do this in Office 265/SharePoint Online? I loved reading this blog. We would like to offer any sharepoint related services for your business needs.